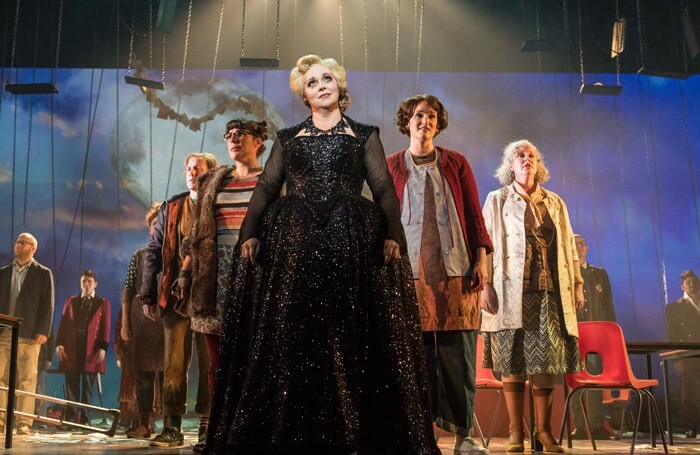 During Into The Woods’ 30-year history it has undergone numerous re-imaginings, including the Fiasco’s ensemble adaptation about to arrive at the Menier Chocolate Factory from Broadway. But James Brining’s bold staging of Sondheim and Lapine’s dark fairytale fusion – the first large-scale co-production between West Yorkshire Playhouse and Opera North – must surely go down in the annals as the first truly epic account. With a cast of two dozen principals drawn from the Opera North chorus, Sondheim’s complex harmonies and lyrics are given full vocal measure. Jim Holmes’s orchestral arrangements too constantly reach into the emotional heart of the score, and there are moments when the entire production comes across as a maelstrom of magic, morality and folk opera. Musically powerful, the production is also visually impressive. Spectacular digital skyscapes add depth and colour to Colin Richmond’s sets, which transform the massive Quarry stage from a cheery junior school classroom, where it’s World Fairy Tale Day, to the terror zone of the woods, where the kids are immersed in the unfolding fantasy involving macabre puppets and a bunch of surreal storybook characters. Eventually, for the show’s tricky second act, the space turns into a vast bleak dystopian vista, a happy-never-after visual statement for Claire Pascoe’s scorching rendering of The Last Midnight. But it’s not all Sondheim musicality, magic beans and scary giants. Some characters could do with more depth. And too often everyone seems to forget there’s comedy in the woods as well as terrors. But this is still a skilfully conceived collaboration, delighting and challenging the ear, the eye and the mind.